The ticketing system will be similar to current modern transit fare systems. 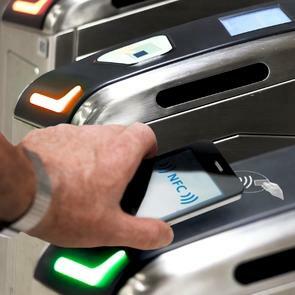 Near Field Communication (NFC) technology will be used, enabling users to pay their fare with one time use tickets bought at the station, a personal transit card, or their NFC enabled smart phone. The big difference between JPods and other transit fare systems, is that instead of using their phone are card to allow passage through a gate or turnstyle, it will be used to open the door of the JPod itself. Once inside, the JPod, the passenger enters their desitnation using the onboard navigation interface.